I was just thinking the other day, that those of us in our fifties now, who were children in the 1950's, are probably one step ahead of most people in this so called credit crunch. Our parents had to work through hard times after the war, things were in short supply so there was a lot of make do and mend going on. Mum taught me how to crochet, knit, and sew. I can picture my mother now on her old treadle sewing machine, she made all the soft furnishings, curtains, cushions etc, and most of her own dresses. When I was old enough to use the machine I followed her example and made my own clothes. I remember I had a good line in mini skirts going, I would get a piece of fabric off the market and knock one up in a couple of hours, then I sold them to my mates. My mum was an expert at making tasty meals out of not very much at all, another talent I have inherited from her. We always went picking elderberries together and came back with masses of them. It was our job to strip all the berries off the stalks using a fork, then they would go in a big pot and simmer on the stove. They were strained through cotton fabric several times and the juice bottled up. This was our Ribena, we thought it was lovely, much better than the shop bought juice which we couldn't afford. March 20th is the aniversary of my mum's death, she died 27 years ago aged 64, she would have been 91 on March 4th. This is a picture of her first son, my elder brother Ingo. She made all his clothes, here he is wearing a knitted jumper and trousers, with matching socks. Isn't he a lovely little fella? He lives in Bremen, Germany. I can't part with this door mat that mum made out of plaited tights. It's never been used, and I keep it in the sideboard that I inherited from her. Isn't she clever making this, just one example of her many ideas. 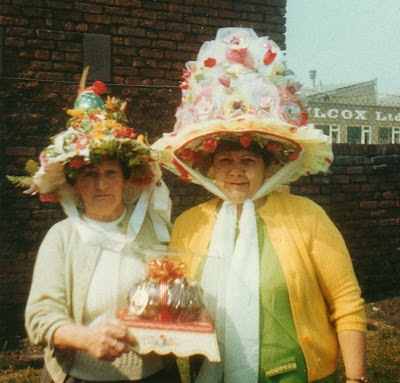 I found this photo of her, proudly holding the prize she won for the best Easter bonnet, her friend and next door neighbour, Mitti, is on the left. She had a creative flair for anything and could make amazing things with a few scraps of fabric and a needle and cotton. It's a shame that younger people don't have role models like this any more, I have got a lot to be thankful for, my mum taught me everything I know about looking after myself, thanks Martha Elizabeth Helen, my mum. Things didn't go right for me yesterday. I got back from Asda and switched my computer on and got a shock, a picture of my lovely Ben on the desktop and nothing else. Not a single icon, nowt, zilch, just my little arrow with nothing to hover over. I had a very good idea what might have happened, and it seems I was right. The night before, I was goooogling, and spotted an eye catching headline in the title of a site. That's interesting, I thought, I'll take a look at that. Clicked on it but it didn't go anywhere, so I carried on with what I was doing. Then, I was reading another page and it disappeared, I thought, that's odd, but carried on, thinking no more about it. The next day I found my computer had been wiped clean. I didn't have time to deal with it because I had arranged to go and meet Lorraine at the Scrap Store to show her what I have been busy making. When I got there I found she had gone, how annoying is that when someone tells you one thing then does another. I went home to see if I could find some help for the computer. A few phone calls to friends didn't sound very promising, it's not something that anyone can sort out, oh by the way my computer is empty, can you put all the bits and bobs back in again for me? I found stuff to do, some more ironing carrier bags together, and making beads, and tidying up. It was like my right arm was missing, I was wandering around the house in a daze, what do I do now, my computer is broken, sob sob. Better news today. I rang a shop in town called Second Byte, the man said bring it in. I said which bit do you want, all of it? He said, no just the tower, so I unplugged it and took it straight in. He rang me just after lunch and said 'it will cost £30, do you want me to do it.' I told him to go ahead. I thought this was a good time to de clutter the office. He rang again at 4pm and said it's ready. Boy was I relieved that it wasn't a few hundred quid. Anyway, all seems to be well, so here I am blogging again, and I've got a lovely clean desk. I am writing this on Friday, due to my computer crashing, more about that on the next post. I had in mind what I was going to write about now it has slipped my mind, my goodness the old grey matter is not what it used to be. I went off to Asda on the free bus, determined to only get things with the yellow 'whoopsie' reduced price stickers on. I wanted some eggs and found a box for 20p, but, shock horror, they were eggs from caged birds. There's no way I would buy those, I do have my principles, there was no reduced free range available, so I shall have to go without then. I found a few bargains, and my bill came to £5.26. I didn't buy any bread because I am eating what I bought from Tesco on Monday night. In fact I have too much bread, but it's hard to pass it by when it is only a few pence, my freezer is full of bread. As I went through the checkout I apologised to the lady on the till because she was having to key in my items due to the stickers. The woman following watched in amazement, and asked where I had found my bargains. I said 'they're all over the place, you have to look for the stickers, and there are some on a trolley in the corner'. I think some people must go round the store with their eyes shut. I've been playing with plastic bags again, there must be something else you can do with them besides cutting them into strips and knitting them. A quick search on the internet, and it seems you can do something called 'fusion', with them. Lay a bag flat cut off the bottom and handles, and turn it inside out if it has writing on it. Then fold it twice so that you have a piece that has eight layers. Get two pieces of paper, I used baking paper, and sandwich the plastic in between. Press down with a hot iron for a few seconds, this is the fusion bit, all eight layers are supposed to stick together. Hooray, it works. I tried it with several bags, the plastic goes crinkly. Best not to have the iron on a high setting or the first layer shrivels up too quickly and the inside layers don't stick together. 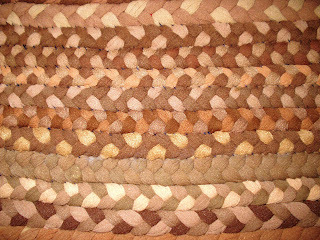 The Sainsbury's bag made a lovely textured orange piece, very interesting, now what can I make with it? I made a square of plain white plastic, eight layers of a charity sack, and put some coloured stripes across it, to see how that would turn out, it looks quite arty. 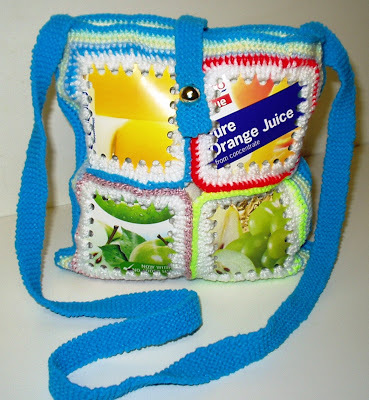 You could cut any shapes out of coloured plastic and make up pictures, or you could sew the pieces together to make bags. I am going to do a few more test pieces to see how mixing the colours turn out, then think what I could make out of them. I've got my friends collecting coloured plastic bags for me. If you want to have a go at this yourself, see how to do it here. I have a plan, an idea to have fun, to get out more, and to meet people. Spring is in the air, and I get a feeling it is going to be the best summer yet. 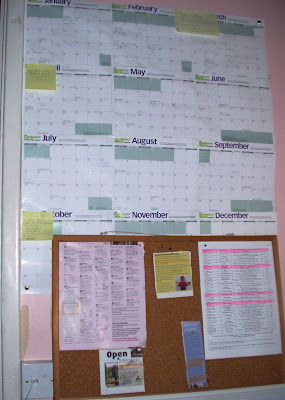 This is my plan, it is hanging on my office wall, a calendar, and notice board that I can pin all my cuttings to. I am collecting information about what's going on in my area, from magazines, newspapers, notice boards, and leaflets at the library. There is such a lot to do if you make the effort of using your eyes and ears to find out about it. I can't walk past a shop window with a lot of posters in it, I have to read and digest each one, is there anything I should know about? The same with the free paper, well it's free, so I read it. All this research is in preparation for when I get my bus pass. My plan is to get as many free days out as I can, find out what activities cost no money, go and take part and enjoy them, take photo's and write about them. I made a start today. We have a walking group organised by volunteers, called Walking the Way to Health in North Lincolnshire, I picked up a leaflet at the beginning of the year. I checked it at 9am this morning and found there was a walk of nearly three miles, starting in the next village at 10.30, just the job, get the boots on, pick up Ben, and off we went. 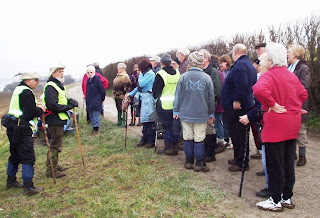 These walks are very popular, usually between 30 and 50 people turn up, I was pleased to see there were people there I had met before. They are a friendly group, always someone to chat to. Looking at the programme I think I am going to do the longer walks of seven miles, a short stroll is pleasant, but sometimes I like to push myself a bit more. Years ago I could easily walk 20 - 25 miles in a day, I remember on my 30th birthday I did a 30 mile walk, organised by the army, a great way to celebrate, I thought. I don't think I will be doing a 60 mile walk in May though, now that would be pushing it a bit too far. I am hoping to get a lot of the dates filled in on my calendar on the wall. I see there is a free tour of the crematorium organised for the end of March, that should be interesting, and there are some art exhibitions coming up at the 20 21 Arts Centre. I'll report my excursions on here. I'm off to my free college course tonight. Daily spend - £1.42 Tesco reduced prices. Bread 13p, salad bag 20p, parsnips 9p, cabbage 8p. I haven't had an arguement with anyone for years, but I found myself shouting at the radio this morning. I even phoned the programme in the hope of being asked to join in, but my offer was not taken up. What was I getting so worked up about? BBC Radio Humberside did a feature about life after redundancy, they tied it in with a two day exhibition on in Hull at the moment, aimed at helping people back to work. One of the recorded interviews was a woman in her fifties who lost her job a year ago, and has applied for hundreds of jobs in that time. She sounded really sad, and at a loss as to what to do next. They then broadcast live from the exhibition, which seemed mainly about companies offering training courses. There was a lot of chat about having to look for new skills if you want to rejoin the job market. This is when I had a little rant to myself, retrain if you want to, but retrain for what exactly? You tell me which industries are looking for new staff, where are the jobs for all these retrained people because I can't see any on web sites, in the job centre, and in newspapers. These exhibitions are nothing but a wallpapering excercise, let's stand behind a facade, get people signed up on courses, that will keep the government happy. It's all about numbers. Sorry if this sounds negative, but it makes my blood boil frankly. They are not dealing with the despair, hardship, and anger that people are facing. Going back to the woman in her fifties. I would like to tell her to stop applying for jobs that she won't get, stop building herself up only to be knocked down again, and stop beating herself up about not having a job. She will end up in a mental home if she doesn't take control of her life now. The best thing she can do is to take a close look at her finances, look at her incomings and outgoings, and if she has a family get them involved too. When she has done that she should work out a new plan for her life which keeps her within the parameters of her budget. There will be some changes but at least she can get on with living the rest of her life. Daily spend - £25.07 diesel. £2.82 Tesco reduced prices. Not sleeping ! ! ! I'm not sleeping very well at the moment, could this be the problem? I have a big bed which I absolutely love snuggling down into, two duvets, two pillows, and the electric blanket warms it up a treat, heaven, well you would think so wouldn't you. For starters my three little friends beat me to it, strategically placed they block the way in, I have to slide under the duvet, gently nudging them out of the way. Then I struggle to pull my teashirts (yes plural usually three) down and get comfortable. 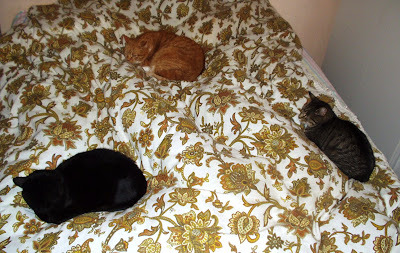 They then reposition themselves, Bugsy wedged against my left arm, Freddie against my right, and Lily across my feet. And that's where we stay all night, me in a straight jacket on my back, not daring to move in case I disturbe them. Next I find the bed vibrating as Bugsy scratches behind his ear, a few minutes later Freddie remembers he hasn't had a bath, and proceeds to wash himself from top to bottom. Yawn, when are they going to fall asleep. I wake up several times during the night, oh how I wish I could stretch, and wriggle, and curl up like a ball, I lie there stiff as a board willing myself to go back to sleep. Then I am suddenly woken up by a loud noise like thunder going through the bed, the rumbling reminds me of the trains going through the underground. Freddie is scratching the side of the bed with his claws to let me know he wants to go out. Half asleep trying not to fully wake up, I groan as I see it is only half past four, he does this every morning, sometimes earlier, sometimes later. I suppose some people would just leave him ouside all night, but I can't do that, he is my baby, and awfull things happen to cats at night. So, back to bed to get another couple of hours shuteye, hopefully. It's been a lovely day today, quite spring like. My seed potatoes are installed on the window sill, hopefully to produce the first signs of life. 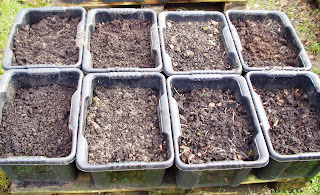 I have been preparing for the new growing season and feel quite excited, I like to be ready. The first year I did it, it was all a bit of a rush, I went mad sowing seeds willy nilly not knowing what was going to come up. I was amazed when I did so well, especially as it was a bit of a hit and miss affair. I don't know anything about the different types of soil, the bugs that eat your food before you do, and when things should be planted, I like the idea of a surprise. I ended up with 69 tomato plants and was eating them untill December. Last year I said I wouldn't grow so much, but did it happen, no! I ended up with 88 tomato plants, and was eating beans, courgettes, tomatoes and cucumbers till they came out of my ear holes. Anyway, I'm getting things ready again, collecting usefull bits and bobs, certainly don't want to buy anything. Have you seen those fancy plastic propogators with a lid? Don't need them. This is what you want, any plastic bottles, yoghurt pots, especially those with a lid on, plastic drinks cups, and plastic food trays. If you haven't got lids a bit of cling film will do to keep the seeds snug till they get going. 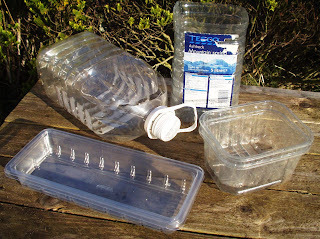 Large plastic water bottles can be cut open on the side to make a propogator, leave the lid attached, or the top cut off for a planter. Food trays are handy, don't forget to cut holes in the bottom. You can put a tray on the top to act as a lid. 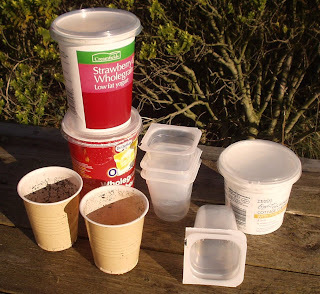 If you are going to give away or sell plants and you don't want to give a pot away with it, use drinks cartons, make holes in the bottom, these soya milk cartons are ideal. 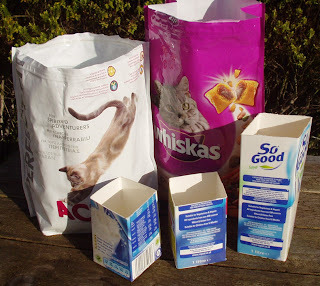 You can also use dry cat food bags to plant stuff in if you haven't much room in your garden. I have made some more plant labels out of an oblong margarine tub, just cut strips of plastic. My plant ties are cut up strips of plastic bags, you can get loads out of a charity sack. These plastic storage boxes come in handy for planting any extras in if you haven't room in the beds. I have to confess I bought these in a rush because I had plants coming up and nowhere to put them., but they will last a good few years and were only 97p each. Last year I had courgettes, broad beans, carrots, beetroot, dwarf beans, and even six runner beans with canes, in them. I lift them off the ground onto wood to give a better drainage. I built a cloche that just fits over four of them while the new plants need protection from the weather. If you want to rearrange your garden you can just move them around to suit. 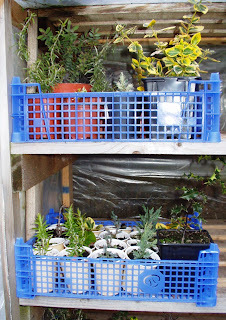 These are the blue plastic crates I get out of the skip outside the takeaway, they are very handy for transporting small pots around the garden. Handy in the potting shed, and the greenhouse. I have got that many now I might sell some to other gardeners. So as you can see I am nearly ready. The raised beds are full of compost, soil, and hoss muck, just need turning over and a bit of fertiliser added. I need to get a fresh bag of compost for the seeds, and the greenhouse and plant shelters need recovering in plastic. I managed to get a free roll of industrial shrink wrap for that job. I might not grow potatoes in compost bags this year if I can find other suitable containers. I had such a job last year picking out all the slugs and snails hidden in the folds of the bag. What a nightmare. We just want the warmer weather now to get things started. Housework is not my first priority, in fact it's pretty low on my list of recreational activities, you could say it is rock bottom. Don't get me wrong, I keep things tidy, but I can't be forever dusting, polishing and hoovering, dysoning in my case. Who was it that said the dust doesn't get any worse after 10 years? Quentin Crisp I recall. I reckon if I don't get the Dyson out, then it's not costing me any money, saving on electricity, and my machine lasts a lot longer than other people's because it doesn't get used, another saving. I apply the same logic to my washing machine, don't use it very often and it doesn't wear out. Makes sense to me, so I wait untill the dust is knee high then do something about it, like this morning. The cats ran for cover as I dragged my four year old almost new Dyson upstairs and started moving furniture about. I gutted the bedroom, giving it a thorough going over with the suction machine, cleaned all the paw prints off the window sill, dusted and polished, and remade the bed. What is it about a freshly made bed that seems to beckon? Fluffed up duvet and pillows, the temptation to slide back in again almost overcame me, I fought against it and carried on cleaning down the stairs. Oh how I hate cleaning stairs. After lunch I took myself off down town to the Scrapstore, I promised that I would help out when I had time. Phil was very pleased with the posters I had made for them. It was a bit quiet so I had a mooch around, getting to know where everything was kept. I have to confess at this stage, that I have an obsessive compulsive disorder, I simply must tidy up. I don't know what causes it, if I see a mess I must tidy it. The fabric department looked pretty messy, difficult to see what was there, just a big jumble of material. I took it all off the shelves, folded each piece carefully, and placed it all back neatly. You can tell I used to work in a shop, can't you, everything on display so you can see exactly what you have got. I organise my kitchen in the same way. Tins and packets stacked tidily in the cupboards, rotating and using it in date order, regularly going through everything to make sure it doesn't get pushed to the back and forotten. Continually checking the freezer, and having an, 'eat everything I have' blitz, four times a year before I go and buy some more. It's amazing how inventive your recipes become when you get down to the last tin of beans and last packet of pasta. It all adds to the challenge of frugal living. Daily spend - £1.80 for 24 seed potatoes. £3.99, bottle of red wine, my treat. You will think I have got nothing better to do than to knock out bags, here is another one, I shall be known as the 'bag lady' soon. I have several works in progress at any one time, and alternate between them depending what I fancy doing, knitting, sewing, or crochet. 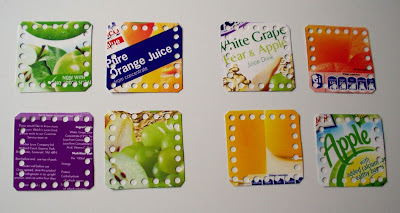 Cut 8 x 7cm squares out of drinks cartons, punch holes around the outside edges. 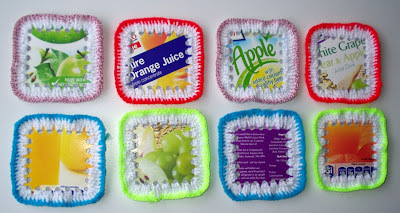 Crochet around the edge of each one with brightly coloured wool. 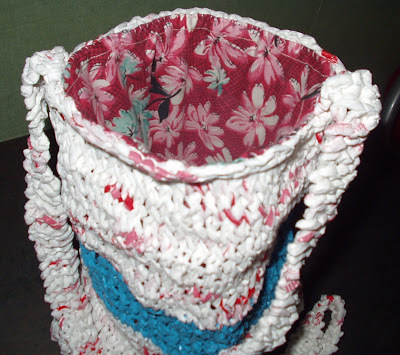 Sew four together, twice, and crochet extra rows around the outside to make the bag the size you want. 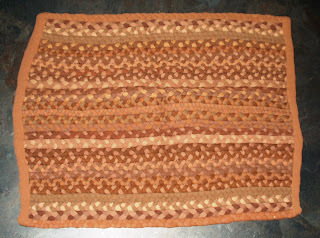 Join the two pieces together with a row of crochet. 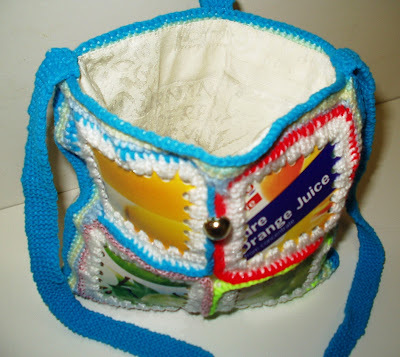 Knit the shoulder strap, 6 stitches, and fastener (with button hole), to match and sew them to the bag. Make lining out of any soft fabric and sew around top edge. Sew button on. Bag is 22cm x 22cm. It's good to have choices in life, but sometimes I think we have too many. I like going with my instincts and doing what I think is best, and dealing with the consequences if I have made the wrong choice. Big decisions need a lot of thought, like which direction do you want your life to go, but now we seem to be bombarded with so many choices for such trivial matters, that can screw you up if you let them. In my quest for a simple life I have made the decision to limit my choices on small unimportant matters, the more clutter I can delete from everyday life the more I value life. For instance, it is important that I spend time getting the most for my money whilst food shopping, but, there are a lot of things I will not eat. This cuts out many of the supermarket aisles which I don't venture down at all. I miss out meat, (fresh, frozen, and canned), cakes, biscuits, crisps, fizzy drinks, alchohol, all freezers except veggies, most of the dairy except yoghurt, soya milk, and cheese. I also give a wide berth to sauces and pickles, jams, household cleaning products, and all non food. It makes shopping so much easier. As I said, I buy my food on price and quality, this also limits my choices, but I like that. When I shop I don't walk around thinking what do I fancy for my dinner. I buy what is on special offer or reduced at the time, and plan my meals around that. Contrary to what most people think, that having a shopping list helps you spend less, for me the opposite is true. If you have a plan for your meals then you have to get the ingredients to make them. I have no plan, I eat what is cheap, even if it means having the same meal for three of four nights on the trot. Less choices to worry about, and less food thrown away because I eat everything I buy. In the house I apply the principal of if you haven't got one you don't need it, and if it doesn't work you can't switch it on, simple. My central heating conked out a couple of years ago, people have offered help and advice to get it sorted, and I have declined. My thoughts are, if it doesn't work I dont have to make the decision whether to turn it on or not, get rid of the choice, it's easier. The same with a television, I don't have one so that takes away the decision of whether to watch it or not. If I had one I know I would sit on my bum for hours and become a cabbage, best to take the choice away and not have one at all. It's a good job I have never tried smoking, can't for the life of me understand why people do that, but that is their choice. 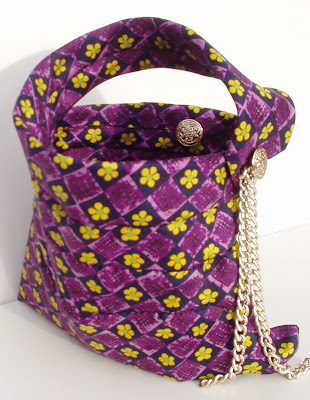 I'm posting early today because I am excited about the bag I have just finished, and wanted to share it with you. It's made from a mans tie which I bought for 50p from a charity shop. I have cheated a bit, I can't claim it as my idea because I copied it from someone at a craft fair, she had several on her table for sale at £5.00 each. It was an experiment to see how easy it was to make, I don't intend to go into full scale production, though some people say I could sell them. It's an evening bag, the tie is swirled round, a bit like a coil, pinned into place and stitched very carefully. The broad end is at the bottom and the narrow end is the handle. It was a bit floppy so I made a stiffener out of an old plastic tablecloth, the same shape as the tie, and threaded it through the middle. 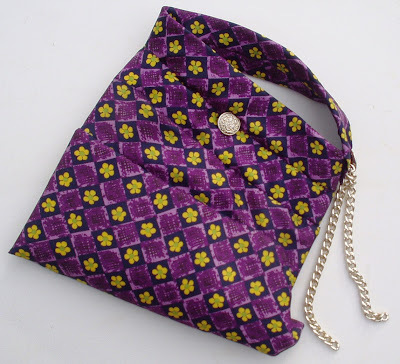 It has a button fastener, I left a small gap where I joined the tie to make the button hole, and there is a matching button to attach the handle to the bag, with a piece of chain added for decoration. I didn't cut the tie at all and it doesn't need a lining. There is room for a small purse, keys, mobile phone, and a few essential small items that a girl might need on a night out. I did a swap today. My friend wanted a lift to the railway station, she's off on her holidays for three weeks, so she gave me some food out of her fridge which would have gone off by the time she got back. Good deal I thought, wouldn't it be a good idea if everyone did a bit of swapping now and then. Now let me see what else I can swap. As I was already in town I called in the bank, checked in at the job centre and had a play on their computers, and had a scout round for some special offers on cat food. I also went into Specsavers to check out the deals on offer for new specs, I am about ready to change mine. They have 30% off frames £75 or over, for people over 60, but it ends in April. I am 60 in May. They told me I might be eligible for a money off voucher from the Job Centre, so I need to check that out. If I can get the voucher they said I should come back and ask for the 30% discount and I would be able to get it. I think it might be worth asking around other optitions to see if anyone can better it. I've had a simple day today. Chatting on the phone, with my sister, and best friend Carol. Designed a poster on the computer for the Scrapstore. Check http://www.downthelane.net/ Forum, I am a moderator. Threw a lot of veg in a pan and made a stew. Read the papers on the computer. Catch up with Corrie on the website. A bit of knitting, handle for a bag. A bit of sewing, making a new bag. Change the template on this blog. 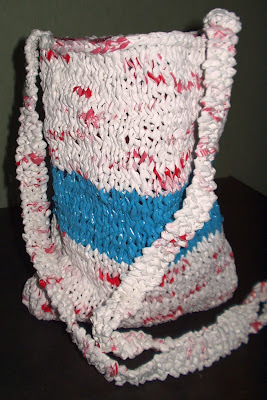 This is my latest bag, I made it out of seven large plastic sacks. It's a shoulder bag with a long handle to go across your body, I think it is much safer to wear it like this rather than just over one shoulder. I knitted two pieces and joined them together using the rug pegger, and lined it with cotton fabric with a floral pattern. It's 11 inches by 8 inches. I think this bag is more a summer bag, perhaps for a day out when you don't need to carry a lot of stuff around. I've found a Scrapstore ! I knew it was going to be my lucky day when I looked down on the ground and spotted a 1p coin. It was rather strange because a few seconds before I thought, wouldn't it be a bonus if I found some money, and there it was, just like magic. I was in town looking for a place my friend had told me about, a place called Scrapstore which had all sorts of unwanted recyclable rubbish collected from shops and factories. It is then used for craft projects. I found it tucked away behind the Blind Centre, there was a board outside and a sign on the fence. I went in and thought I was in heaven. There was all kinds of usefull stuff, card and paper, plastic bottles, fabric, wallpaper, beads and jewellery, net, lace, fur, ribbon, and a million and one other things. I had a chat with a very nice lady called Lorraine, she told me they could do with some more volunteers, and I met Phil who also works there. I popped into the market while I was in town, and I'm pleased to say they have my cats favourite Felix food back in again, at £2.75 a box. It's £4.05 in the supermarkets so a good saving there. They also had some dog biscuits in for 50p, I got a couple of boxes for Ben. The pet shop in the market is always buzzing, they do a roaring trade. A quick look in Aldi to check on prices, I park my car next to the store on waste ground, never pay for parking. The prices were the same as the big supermarkets, the only bargain I spotted was a big bag of potatoes for 69p. I went on the free bus to Asda this morning, it gets me out of the house for a couple of hours, and I might pick up a bargain or two. I was busy nattering to someone and nearly missed it, I hate waiting for buses and would much rather arrive at the bus stop a minute before the bus does. Not many yellow 'oops' stickers about, I only managed to find five items, I was determined not to buy anything that hadn't been reduced. I was almost tempted to get a cheese and onion flan, but decided against it, too much fat and salt. I try and limit my intake of processed food. I spotted a yellow sticker on a cabbage, but soon put it back on the shelf when I saw it was 67p. I bought one a couple of weeks ago for 25p, have they gone up that much? The snow came down again this afternoon, everything was covered in about ten minutes. I walked to my friends house, and took my best friend out, her dog Ben. He is so lovely, it's great to be able to borrow a dog. I am writing this on the 14th February. I made a mistake last night while trying to remove some labels from the post I made on the 11th February. I messed up, and the whole post disappeared. I am quite upset about it because it received two comments which I wanted to reply to, and it was an interesting subject. With my memory being as it is, I dont want to rewrite it because it will not be the same. I started this with the intention of posting every day, so I could pass on ideas about living a simple life, I do apologise for this post which fills this gap. From what I do remember the first post was how to keep positive and not worry about having very little money. The message is the same, enjoy your life after money, it aint that bad. What is the meeow name for 'sucker', because I think I must have it stamped on my forehead. 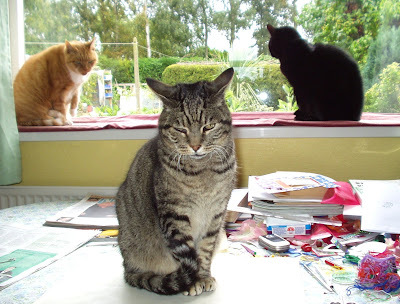 It all started with one cat, a little fella who didn't have a proper home, his owner went off and left him to fend for himself at ten months old. I fell in love with the little bundle of ginger fur, so I took him in. Bugsy is now twelve years old. Next a scruffy, filthy, battle scarred black tom appeared at the back door, looking pleadingly at me for some food. Of course he got it. A few weeks later a trip to the vet, and he moved in, haven't the faintest idea where he came from. I asked around if anyone had lost one, but no one came forward. It was hell for about eighteen months as Freddie, named after Freddie Mercury, attacked Bugsy to try and drive him away. I almost gave up, poor Bugs ended up with bitten bleeding ears, and lumps of fur pulled out. Eventually things settled down. My back door is often open as the cats like to wander in and out. One day I caught a very small tabby cat stealing the food, and he kept on coming every day. I asked around the neighbours and was pointed to the house he belonged to, I went to ask about him. 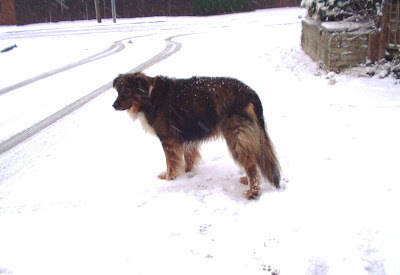 Yes he did belong to them, he is called Smartie, he is 13 years old and he lives down the garden in an old dog kennel. I spotted the filthy food dishes outside the back door. The man said, 'kick him out.' I couldn't do that, poor little soul wants a bit of home comforts at that age, so he stayed. He has put on a bit of weight now he is getting some good food. I have been back several times since with some updates on how he is, but they are not interested.The last time the man said, 'oh, is he still alive.' Yes he is and he's gorgeous. No, no more, please! We have been getting regular visits from a black cat a few doors down, most of the time he steals the food and goes, but sometimes he settles down on the settee. I definately don't want any more......but it's fine if he calls in sometimes for a bit of love and cuddles. Oh dear I am a sucker ! I've spent a bit of time reflecting today, on how lucky I am. I try not to take life too seriously, but sometimes when you hear about something awful happening, all the niggling things that aren't quite right in your life suddenly become inconsequential. We've been seeing pictures of the terrible fires in Australia which have claimed many lives, such a terrible tragedy. The news that Jade Goody's cancer has spread, very sad for a woman of such a young age. And now we hear that William Roach's wife Sarah, has suddenly died at age 58, a year younger than myself. It goes to show that life is a lottery, no one can say what lies ahead. The old saying that life's too short to worry, is very true. We have to live each day as if it is our last. Tomorrow will be a fresh new start, as every day is for me. What has happened the day before has gone, it can't be changed, it is finished. Every day I say Thankyou. A bright, crisp and sunny start to the day. 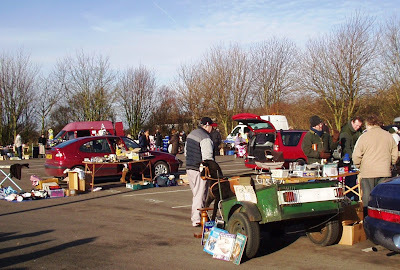 As soon as I had finished my bran flakes I took myself off to the car boot sale at the football ground opposite Tesco, a few brave souls had set up shop. I wanted to search for some brightly coloured thick knitting wool, and a medium sized crochet hook, for a future project. Couldn't find any anywhere. But what I did find was a big pile of clothing and household linens, the woman shouted, 'Any five for a pound.' The little cogs in my brain were spinning around, now what could I make out of this? I managed to find some decent good quality fabrics, and stuffed them into the carrier bag which she handed to me. I had a mooch round Poundstretcher whilst I was close by. As soon as I walked through the door I spotted the big yellow stickers in a basket style display, out of date food. I got three tins of sweet and sour sauce for 9p each, a bag of dried apricots for 5p, and vacumm pack of tuna steak in sauce for 5p, sadly the last one of those. I have just eaten the tuna fish for my lunch, what a bargain. I had a nice afternoon out today, even though it was very cold. 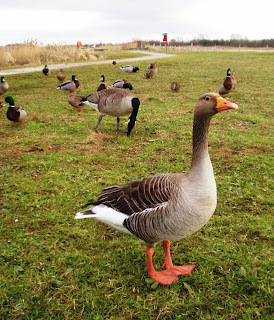 I went to Barton on Humber, not far from here, it's near the Humber Bridge. My friend told me about a craft fair that was on, at the Waters Edge visitor centre, so I thought I would go and have a nosey round, might pick up some ideas. I went to the Ropewalk first, it's an arts centre nearby. I like to see the hand made crafts, there was some lovely handbags, but oh so expensive. I think if they dropped the price a bit they might sell some, a few scraps of fabric and some buttons for £40 seems a lot. I saw a couple of friends at the craft fair, they had a stand each, one sells cards and the other cushions. I used to see them several times a year when I sold at the fairs, but I closed my business, it just wasn't worth doing any more. I felt a bit guilty looking around the stands and not buying anything, because I know what it's like to chat to people and hope they will open their purse. I saw some very unusual handbags made from men's ties, a clever idea, I know a charity shop that sells ties for 50p so I might try that. Outside there is a country park, too cold to walk very far today so I think I'll come back in the spring, maybe when they have the next craft fair at Easter. 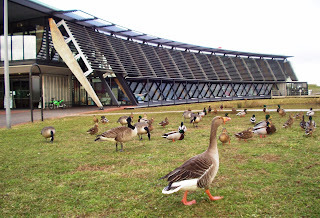 This is the centre and the ducks, there are birds everywhere. I am spending a lot of time indoors at the moment, although the snow has almost cleared up here, it is so icy it's treacherous to walk anywhere. I've had a few short walks with my friends dog, but have to keep crossing the road to find a bit of pavement that is not covered in ice. I've been learning to crochet today, but it's slow progress because my hands are cold. There are some excellent videos on youtube, I found this one particularly helpfull. http://www.youtube.com/watch?v=OtmOEzm_OXQ&feature=channel There are several short videos explaining the basic stitches, enough to get me going. My mother taught me how to do this when I was a child, but I had forgotten. I'm going to close this down now and get some more practice. I took my car in for a service this morning, I'm not sure if it actually needed it because I have only done 6,000 miles in a year, but I know the lads at Central Tyres will give it a good check over. I don't take it back to the dealer for servicing because they seem to cost a fortune, and now I have found a reliable garage, where they are honest and straight with me, I think it's worth sticking with them. 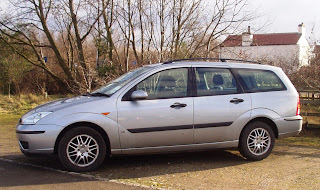 I love my Focus Estate, I've always had Fords, always estates, and always diesels, I like the versatility of the vehicle. Mostly I have the back seats down because I tend to carry stuff rather than people. I've had it full of pallets and timber, chopped up furniture to take to the tip, the trunk and branches of a tree I took down in the back garden, my bicycle, and other people's dogs. It also doubles up as overnight accommodation when I am travelling a long distance, throw some cushions and bedding in the back, a camping stove and a box of food, that's all you need, saves a fortune on hotels. Anyway, my filters are changed, fresh oil in there, they told me to keep an eye on a back tyre, still legal but may need changing in a few months, and one of the brake discs is starting to get groovy on the front. Nothing to panic about, it will last till the next service, they will check it again when I have the tyre changed. It might seem a bit odd for me to have a car, when I am on a very small income, sitting in a freezing house with no central heating and I don't have a television set, but that is how I prioritise my needs. My frugality gives me the things which I consider are important. I have had a lifetime of moving around in my job, I would be thoroughly miserable if I didn't have the means to get out of my village. My freedom of movement means everything to me. At the moment I am knitting another bag with video tape, another bag with plastic bags but it will have a lot more colour this time, still deciding how to finish the coffee table made out of cat food boxes, and I'm making some more beads. I am collecting clean uncrushed drinks cans for a project, and unusual shaped glass bottles and jars for another idea I have. I think I may have to have another de-cluttering day soon. We had a new teacher at college tonight, I do social sciences on a Tuesday, and he was stepping in for Em who could not make it. Young Danny, I say young because he looked more like a student than a teacher, made the subject of food quite interesting. We talked about what influences our choice of food, diet and poverty, food and health, and who is responsible for what goes in our mouths. I said I am responsible for what I eat, but then I realised I am not responsible for how crops are grown and what goes into processed food. We discussed where we buy our food, and how the supermarkets influence what we buy. We agreed that the special offers always seem to be mostly junk or unhealthy food, and Danny said that the cheapest food was junk food. I disagreed with him on that one, because I can make perfectly healthy meals for very little money. All the more reason to make meals from scratch. There wasn't many bargains left in Tesco tonight, but I did get six packets of six wholemeal hot cross buns for 10p a packet. I'm sure they will fit in the freezer, if not, it's hot cross bun cheese rolls for the next few days. Snow, teeth, and soya milk. As I listened to the weather reports on the radio this morning I wondered if my B & Q work mates had been able to get to their new depot in Doncaster, after the heavy snowfalls overnight. If they had managed to get there it is not ideal for taking an articulated lorry out, the snow is quite deep in places. I cleared my driveway to get my car out. I wouldn't normally bother to go anywhere when the weather is like this, but you can't miss a checkup at the dentist because you never know when you can get another appointment. Anyway, my lovely lady dentist said my teeth are fine, see you in nine months. I'm glad I look after me teeth. A quick call into Tesco on the way past to collect my free tub of Lurpak butter using a voucher that came through the door. I wanted some So Good soya milk but it was too dear at £1.26 so I didn't bother. As I was also passing Morrisons I called in there as well to see if they had a bargain or two. Guess what, my soya milk is £1, so I had three cartons, a good job I checked it out. I also picked up a few reduced bargains as well. College is cancelled tonight because of the snow so no late night shopping for me. I hope they don't cancel tomorrow night as well because I need to get my cheap reduced price veg, dairy, and bread, I'm running a bit low. Still there's always my store cupboard and freezer to fall back on, I could live off that for a month. Nothing pressing to do today, can't be bothered to do any household chores except get rid of a mound of pots, no not thrown, but washed and put away. It's been snowing, so I got into some de-cluttering. It takes me ages to make a start on this, but I always feel a lot better when it's done. I think you reach a certain time in your life when you have got to stop accumulating stuff, and start getting rid of it. Trouble is, what do you keep and what do you dump? I have started to be a bit brutal. Things that have no obvious use will go to the charity shop, that is mostly ornaments. So much easier to dust when there is nothing to dust around. I have decided that if I get rid of stuff I don't need, then it is out of my sight and out of my mind, and I will forget I ever had it. This has got to be better for the brain, less to think about, less to worry about, and less to keep shifting around. Sorting through stuff that has a sentimental value can slow the job up, you start looking through photograph albums, and reading old letters, then putting them back in the drawer because you can't bring yourself to sever all ties with the past. It's understandable that personal memories can't be discarded, they are a record of your life, so you hang on to them. These should be the items that are passed on to the next generation. De-cluttering can be a liberating experience, it lightens your load, gets rid of the dead wood, and makes way for new growth. We move on in life, we don't need to drag all our accumulated stuff with us. If you look to the bottom of the page you will see I have started a list. I will be adding free items I have been given, or have asked for, or have found. They will be usefull things that I can make something with. I want to reduce my buying stuff from shops, and hopefully reduce my impact on the planet. Eventually these things will be discarded, to be passed on to someone else who can use them, this is the natural cycle of life.